Hotel Shree Hari Niwas is located on the foot hills of Trikuta Hills. It broke the traditional paradigm of luxury and redefined luxury and excellence in service amongst other hotels in its vicinity. Seeded with all the latest infrastructure and modern architecture, with its quality of service it will surely blow your mind. The hotel staff is very motivated and attentive so that they can cater to your each and every need. The personalized warm service is must now a days and hotel Shree Hari Niwas leaves no stones unturned in providing a caring environment. 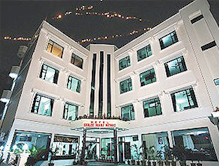 It is the ideal hotel to stay during your visit to Katra. Even for the business and leisure travelers it provides the perfect accommodation and facilities, while providing a scenic vista to crave for throughout one’s life. The travel desk in the hotel provides you with local travel information and arrangements. 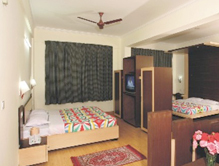 There are a total of 52 Luxurious Rooms and Suites in Hotel Shree Hari Niwas. There are five room options to choose from - Deluxe Double Room, Super Deluxe Room, Triple Bed Room, Family Suite and a Honeymoon Suite. Each and every room has its own added perks, but all the rooms are fitted with the latest amenities that make the stay more comfortable. This hotel is the perfect solution to solve your dilemma of finding a good luxurious place to stay during your vacations in Katra. The rooms provide enthralling view of the majestic Trikuta Hills and the township. The Grand Lazeez Restaurant is the restaurant in the hotel premises. It is a pure vegetarian restaurant that dishes out lip smacking food. Sit, relax and dine in this comfy restaurant with state of the art design, and attendants that treat you as family members. The food will surely tranquil your tastebus.